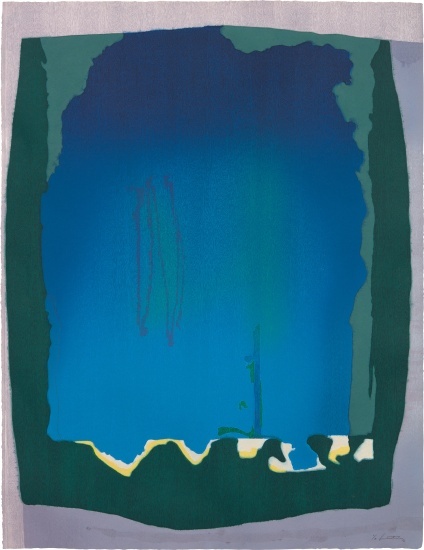 Frankenthaler's most important and challenging print. Freefall is printed on sheets of TGL [Tyler Graphics Limited] handmade paper that are dyed or stained with color before being printed with woodblocks. Frankenthaler began each print by “drawing” with dyed paper pulp on a freshly formed sheet, as if she were creating a work on paper with the pulp. The paper was like a blotter to which she added the dyed pulp, melding the fibers into a single entity. . . As always, she paid particular attention to the registration of the blocks so that there is neither an overlapping of the colors nor an unwanted gap between them. Monumental woodcut and hand-dyed paper in colors, on TGL handmade paper, the full sheet. Signed, dated '93' and numbered 6/30 in pencil (there were also 12 aritst's proofs), published by Tyler Graphics Ltd., Mount Kisco, New York (with their blindstamp), framed.